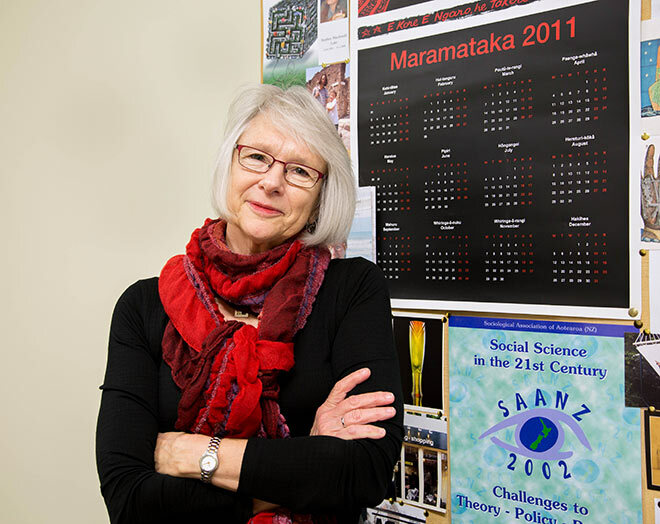 Rosemary Du Plessis was the theme editor for Social Connections, the sixth theme of Te Ara, which was completed in 2011. She is pictured in 2014, just after accepting the Mary Fran Myers award (for research into gender issues in disasters and emergency management) on behalf of the team which worked on the National Council of Women New Zealand Christchurch branch's oral history project 'Women's voices: recording women's stories of the Canterbury earthquakes'. Du Plessis, associate professor of sociology at the University of Canterbury, was the research co-ordinator for the project. Te Ara is all about assemblage – the accumulation and combination of words, visual images, movie clips, graphs, sounds, music, voices, numbers and personal stories. While one person is identified as the author, each entry works because it is the product of many people – an amazing team of writers, editors, researchers, designers and IT specialists who produce this glittering combination. Theme editors come and go as temporary nodes in this cross-disciplinary production. They come into the team because they are embedded in networks of relationships in particular fields – politics and power, New Zealand history, the natural environment etc. Through their networks they recruit authors into the system of production that is Te Ara – this endless weaving of words, images, facts, figures and sounds that re-present Aotearoa New Zealand to its people and the world. There were times when all the synapses in my brain would fire at once when I saw how an entry would come to life as words were linked to photos, film clips, personal stories, old newspaper advertisements, sound bites or bits of music. At other times this excitement would be swamped by the more mundane pressures of extracting entries from authors, editing them, getting them resourced, checked and through the system. But it felt as if I was always on a learning curve; it was never, ever, boring. The best part of my time as theme editor was immersion in the combination of individual responsibility and collectivity that is Te Ara. Intensely focused on our own stuff, we spent hours staring at computer screens. On the other hand, there was also the daily ritual of the Dominion Post quiz, lively resource meetings around Jock Phillips’s table, Monday mornings when you found out what everyone else was doing, huddles around computer screens as the design team previewed entries, and conversations about movies, books and holidays over evening drinks. And it was those moments of connection (sometimes carefully facilitated by Jock or Janine Faulknor, sometimes totally spontaneous), that sustained the creative energy, the commitment, and the innovation that made Te Ara such an unforgettable work environment.